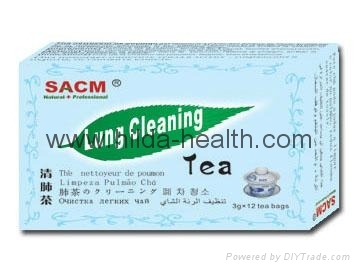 Lung Cleaning Tea formulated with high quality herbs,which are commonly used to clean the lung and throat in Chinese medicine theory, It is effective to clean heat and phlegm in lung and throat. [Ingredients] Bamboo leaves, Loquat Leaves, Honeysuckle Flower, Reed Rhizome, Platycodon Root, and Green Tea. [Actions] To clean heat in the lung, reduce phlegm, stop coughing, help produce salive and slake thirst. [Indications] For lung heat, phlegm, cough and dysphoria. [Directions for use] Take one tea bag each time, two or three times daily. Steep one tea bag with 300-500ml boiling water for 20 minutes. The tea bag can be used for the second time after finishing tea. [Warning] This product can not replace any medication. [Storage instructions] Kept in a cool, dark and dry place. [Packaging] 3g*12 tea bags per box.